What Happened Before The Big Bang? Do We Know? We are part of a great big universe — and for a long time, one of the greatest challenges in all of science has been figuring out — how the universe got here? What came before the Big Bang? Most scientists think it has a lot to do with the Big Bang, when basically, everything started out compressed, and very, very hot. Then at some point, around a hundred decillionths of a second after the Big Bang, something triggered cosmic inflation, when the universe suddenly expanded. Then, it quickly started cooling down, eventually developing into the universe we know today, full of things like mass, and energy, and light. Working out the details of just that whole process… was hard enough. But, the fact is, we are still totally clueless about what happened before the universe started to expand. This initial fraction of a fraction of a fraction of a fraction of a second is the one period in the history of the universe that physics, as we know it, can’t explain. It’s known as the Planck Epoch, stretching from the literal beginning of time to ten million trillion trillion trillionths of a second later — a decimal point, 42 zeroes, and then a 1. It’s named after Max Planck, the physicist who proposed that energy was organized into tiny packets, called quanta. He basically kickstarted the study of quantum mechanics, the science of the very small. But figuring out exactly what happened during the Planck epoch is… a little bit tricky, because we simply don’t know enough about how physics worked during that very brief time. All we really know is that, according to the more widely accepted models, right after the Big Bang, the universe was so hot and dense that all of the forces in the universe were bundled together at the same time. That means that, what we understand today as the four fundamental forces of physics — electromagnetism, plus the weak and strong forces that make subatomic particles work the way they do, and gravity — were all the same thing. Then, as the universe started to cool, they began to separate into distinct forces that had their own, individual effects. But that’s basically all we know. Because we don’t have a way to describe all four fundamental forces at once, using the same set of equations. Why not? Well, essentially, we have two really excellent models for understanding how the universe works: We use quantum mechanics to talk about the very small, like subatomic particles, and the particles that they’re made of, and we have general relativity, to talk about the very fast, and to explain how gravity works. Which is great! It took generations of the very smartest people who have ever lived on this planet to come up with those two models. But… they are incompatible. Because they basically use totally different kinds of math. 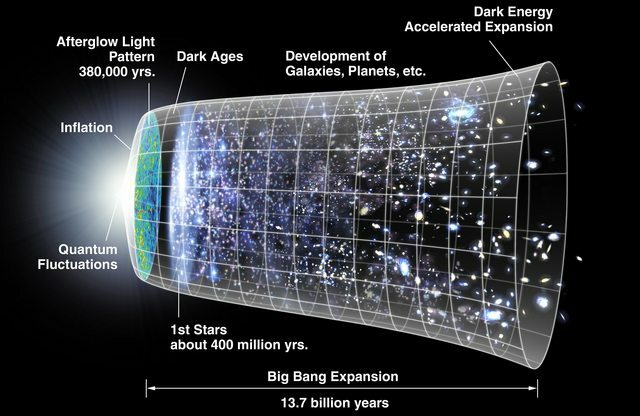 The Big Bang and expansion of the universe. ©JPL.NASA. As a result, the physics of the Planck Epoch, when those forces were combined, just doesn’t make any mathematical sense. In quantum mechanics, for instance, everything is based on probabilities. You wouldn’t say that an electron is in one particular spot; instead, you’d say that it has a certain probability of being in a certain spot, but there’s a chance that it could be somewhere else. In general relativity, on the other hand, gravity is mainly described without using probabilities. Instead, you can explain how the force of gravity changes the universe around it using specific numbers. Which is terribly handy. But, with the Planck epoch, when the forces were all tangled up, physicists are faced with this weird period where, in order to understand it, they’d have to calculate the effects of gravity in terms of probabilities… while also trying to describe the quantum mechanics that were going on with absolute, specific numbers. Which is impossible. Because the equations we use to describe those forces use different sets of rules. Getting these competing sets of rules to match up is kind of the Holy Grail of physics. That’s what Stephen Hawking and countless other physicists have been questing after for decades — a theory that explains all of the forces in the same equation. A Theory of Everything. But, for now, no such theory exists. So, for the vast majority of cosmic history, science has a pretty good handle on how the universe got here, even if we’re still working out some of the details. But those first few moments are still a mystery, one whose solution will completely change how we study the universe.